“Children are not the things to be moulded but people to be unfolded”. – Jess Lair. Hearty welcome to you and your little ward to the portals of ‘Kidszone DPS Bhopal’. The entry of your child to Kidszone is the advent of long lasting bond of ever growing experiences, dreams to be realized, bench marks to be made and unfolding opportunities for a bright future. 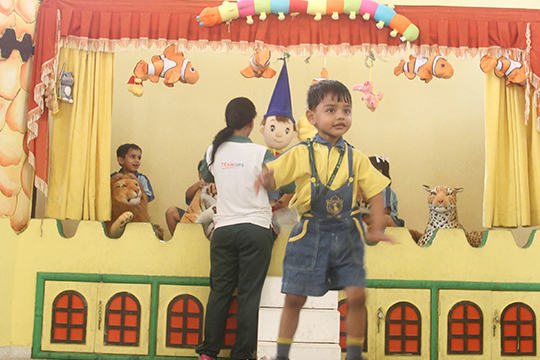 At DPS Kidszone Bhopal, we strive to create a warm and stimulating environment where learning is fun and child centric. Kidszone represents an image of kids world, full colours, dreams and fantasies. child grow into a human being of character, substance and values. Today, the challenges of bringing up a child has increased tenfold. It is not just getting good grades in school but it is about raising an individual who is intelligent and empathetic towards others. Together, we share our responsibilities to give our little Kiddos roots of responsibilities and wings of independence in life. To attain this dream, together we cooperate and collaborate in partnership. The curriculum designed at Kidszone will give them tremendous confidence and will lead to their holistic development and help them to be well brought up and reared Global Citizens.